When I went to Rolex one of the trade fair booths I visited repeatedly was the Clever with Leather booth. There were probably hundreds of halters, belts, dog collars, and purses in several base leather colors (black, chocolate, chestnut) and many, many padding/piping colors. Somehow I managed to not buy anything, but only because they didn't have my desired color combination in Riley's size. I grabbed a fistful of business cards which I lost for nearly a year, and found the other day. How happy I was to find them! This was what Bob got me for my birthday or Valentine's Day (I forget). It came 3-4 weeks ago. Even though the color isn't reproduced well in this photo, is it not lovely? It will brighten up Riley's slightly faded chestnut coat. So I'm an enabler: you can own one too! Oh my goodness, it's gorgeous! It has such a classy and well-made look about it. Hmm, I don't see the halters on their site...did they remove them or am I just totally missing them? I got a black and purple bridle from pinkequine.com for my pony and a matching halter would be awesome! I want to see a picture of Riley in it - I must know what that colour looks like on a chestnut! Actually, I don't need any leather goods at the moment, but I will certainly keep the link. Wow, I love that halter! It's going to look stunning on Riley. I was looking for/didn't find the halters as well. I didn't see hunter green as an option there, but would love black and hunter green for a halter... Now I'm totally going to look to see if anyone online has that! 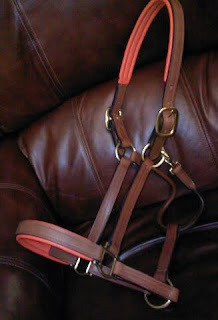 The listing for halters is below bridles, but there are no pix. That's why Rolex is so USEFUL for the die-hard shopper! You kind of have to imagine how the piping will look as a halter. Clair is awesome, we're lucky to have her in the area. I'm still not seeing halters below bridles! I wonder if it's not working on specific browsers or something? The halter is beautiful! I want one!! I also didn't see a listing for halters :( Is it not on their site? Wow those are beautiful and such a nice diversion from the normal colors. Well, he hates to shop and he's happy to have me locate the item and provide him with the order info. these are beautiful! your blog is inspiring- i just found "stumble" on your site and checked it out and it's great! thanks for the post! How much do these halters cost? I would love to have one! How much do these halters cost? I would love to have one!!!!!!! Hi, It's less than a Stubben, about $100. Ok, silly question... how do you use a halter like this? Every day, tying your horse with it on? Or just at shows when leading your horse around? For turnout, figuring it's safer than nylon would be? Hmmm. It's a leather halter, which strikes me as a pretty functional thing. That was meant as an honest question, no insult! It's very nice looking so I'm curious. I'm surrounded by horses in nylon halters or western show halters. You can't tie in those because of the silver buckles - any kind of pressure bends them and the halter falls off. I just don't know if you use a leather halter entirely like you could a nylon one. I think you wouldn't want to tie with a leather lead rope if your horse might pull back, but don't know if the leather halter is actually safer and less abrasive?